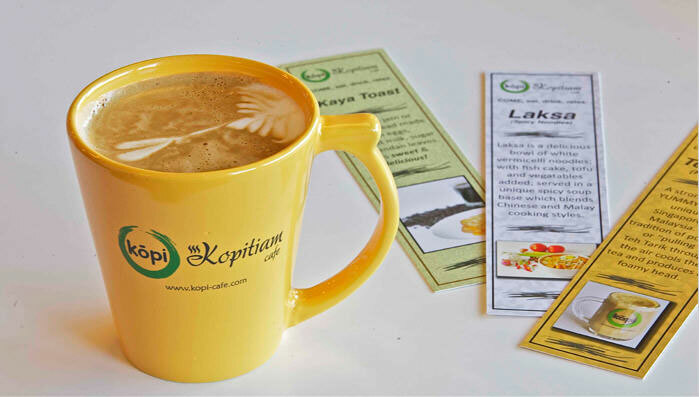 Here are some of the specialty drinks you can enjoy at Kopi Café. We also serve bottled water, juices and various specialty & carbonated drinks. Come back often! 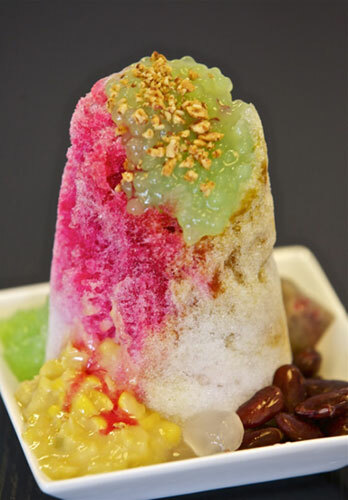 Recent Item: Ice Kachang (see details)! 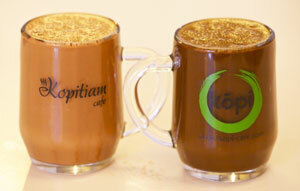 We invite you to try a cup of Kopi. 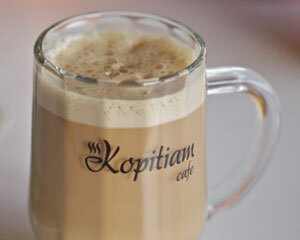 Kopi or Straits Coffee is a thick and strong cup of Cappuccino. Kopi means coffee in a Chinese dialect. 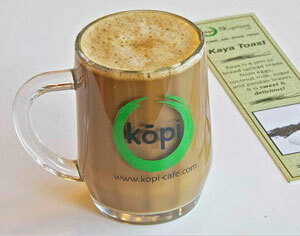 If you need a kick in the morning, try KOPI?it is guaranteed to grab your senses! 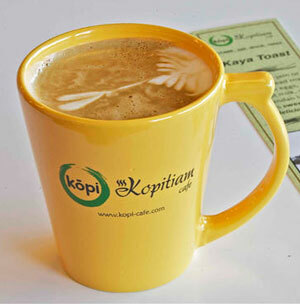 Origins And Traditions ?In Southeast Asia, before there was Cappuccino, there was KOPI. 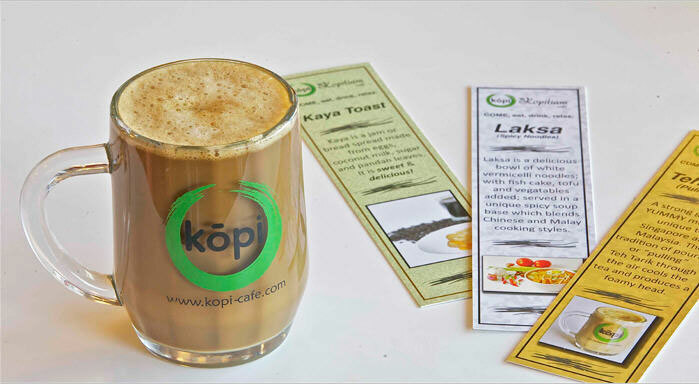 Kopi is typically made from Robusta beans. Robusta beans are known for their higher caffeine content and as their name suggests; a robust flavor. Maize, sugar and margarine are added to the roasting process. This unique roasting process gives Kopi a thick and notorious sweetness. 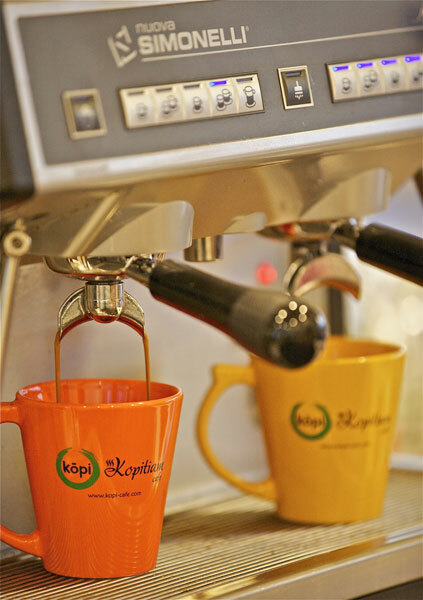 Kopi has an age-long tradition of being brewed through a steep metal pot with a cotton "sock" filter. The water-filtered black coffee is accompanied with sweetened condensed milk, evaporated milk and sugar which usually remain unstirred so that customers can adjust the taste of their coffee to their desired sweetness. We brew our specialty coffee roasted fresh from Moksha Coffee Roasting, our local roaster. All our coffees are served with a 'double shot'. Espresso We make our specialty coffees from the best Arabica beans; roasted locally for extra freshness. 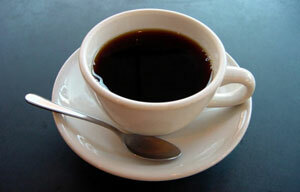 Origins and Traditions ?Coffee is brewed from roasted seeds of the coffee plant or cherry. It was first discovered in Ethiopia and is now grown and cultivated in over 70 countries, primarily around equatorial regions of Africa, Latin America and Southeast Asia. The unroasted green coffee bean is so common that it is traded around the world as an agricultural commodity. Coffee can have a stimulating effect on humans due to its caffeine content and is one of the most-consumed beverages in the world. The Perfect Cup ?Coffee is obtained by brewing ground coffee beans with hot water at 180°F for approximately 4 minutes and consumed around 160°F. Grounded coffee beans should be used quickly so as not to lose the freshness. Poor roasting and brewing can produced a bitter or bad tasting coffee so don't trust your coffee and money to just anyone. Americano Espresso served with hot water added. Latte Espresso with steam milk. Macchiato Espresso with a dollop of hot foam. Pressurized - This forces hot pressurized and vaporized water through ground coffee. As a result of brewing under high pressure, the espresso beverage is more concentrated (10 to 15 times) as compared to gravity-brewing methods and has a more complex physical and chemical constitution. A well-prepared espresso has a reddish-brown foam called crema that floats on the surface. Cold Brew - Coffee brewed in cold water, resulting in a brew lower in acidity than most hot-brewing methods produce, by steeping the coarsely ground beans in cold water for several hours, then filtering them. Tired of weak, bland tea drinks? 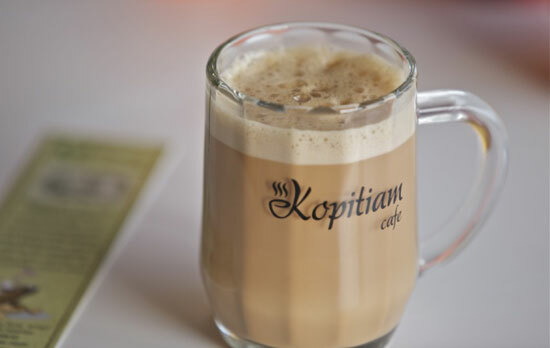 Let our Teh Tarik give you a KICK! Teh Tarik (Milk Tea - Hot or Cold) is a YUMMY milk tea unique to Singapore and Malaysia. This popular beverage comes either hot or cold and is made with a special strong flavored black tea, frothed to perfection. You can specify the level of milk and sugar to suit your taste. Roti or Kaya Toast is the perfect complement to balance the sweetness of Teh Tarik. Teh Tarik (Milk Tea - Hot or Cold) (literally means "pulled tea") is a YUMMY milk tea unique to Singapore and Malaysia. 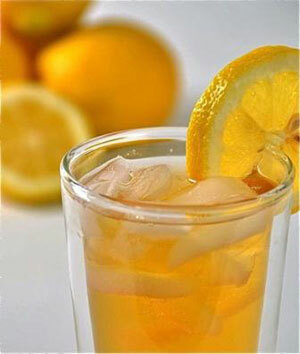 This popular beverage comes either hot or cold and is made with a special strong flavored black tea, frothed to perfection. You can specify the level of milk and sugar to suit your taste. The ubiquitous Roti or Kaya Toast is the perfect complement to balance the sweetness of Teh Tarik. Origins and Traditions ?Originating from Malaysia, but famous the world over, Teh Tarik holds a special place in the hearts of Southeast Asians. More than just showmanship and tradition, pouring Teh Tarik through the air (hence its name "pulled tea") cools the tea and produces a foamy head. Teh Tarik is typically served in a clear glass so that the perfect mixture can be seen and appreciated. Ask to see your cup of tea expertly "pulled"! 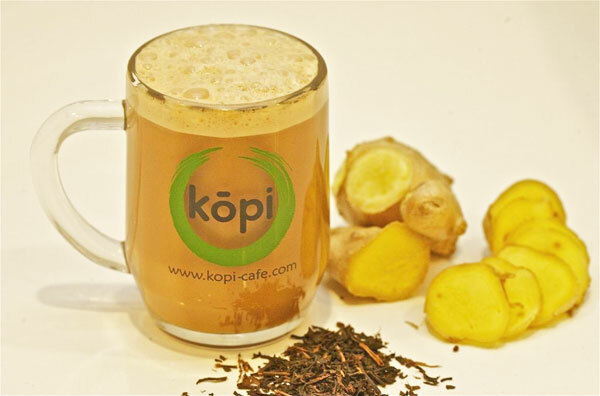 Ginger Teh Tarik "Hot Ginger Milk Tea" – Our traditional favorite Malaysian/Singapore style pulled milk tea with ginger extracts. For centuries, ginger has been a natural remedy in combating various kinds of ailments. It is believed to help to relieve stress, encourage blood circulation and boots immunity. Ginger Teh Tarik ("Hot Ginger Milk Tea") Our traditional favorite Malaysian/Singapore style pulled milk tea with ginger extracts. For centuries, ginger has been a natural remedy in combating various kinds of ailments. It is believed to help to relieve stress, encourage blood circulation and boosts immunity. Iced Lemon Tea – Our traditional Singapore / Malaysian Ice Lemon Tea will bring you back to the warmth of the Malay Pennisula. 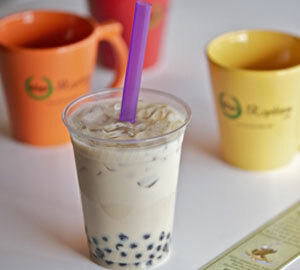 "Boba" (Pearl) Milk Tea "Boba" or "Pearls" are added to milk tea to add a chewy twist to a sweet tea drink. 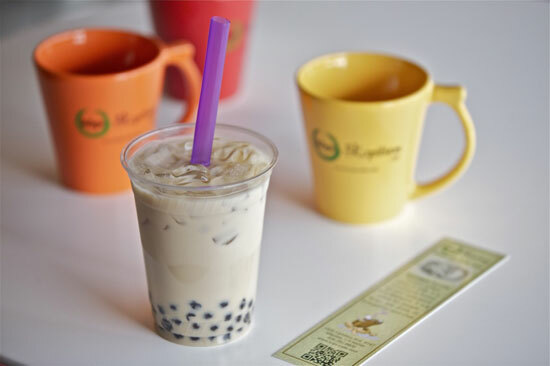 "Boba" (Pearl) Milk Tea This variation of the milk tea was first popularized by Taiwanese. They brought it to the US and it has become a favorite afternoon drink for Americans as well as local Chinese. 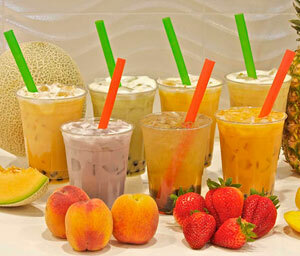 "Boba" or "Pearls" are added to milk tea to add a chewy twist to a sweet tea drink. 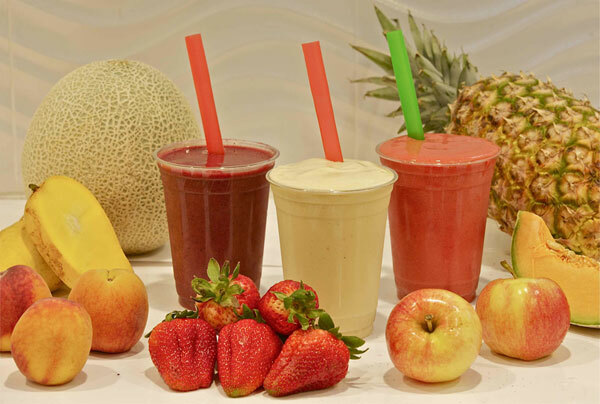 Cool down with our naturally refreshing SMOOTHIES today !! 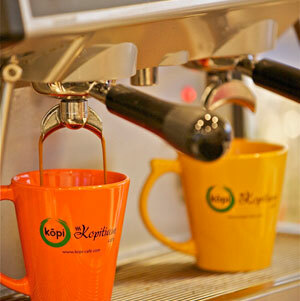 Kopi Fruit Smoothies We blend natural fruit smoothies for great taste. We can also add a BOOST to your smoothies! 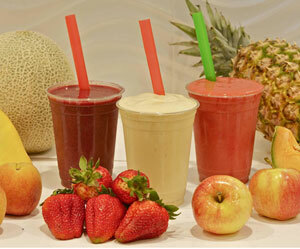 Fruit Smoothies We blend natural fruit smoothies for great taste. We can also add a BOOST to your smoothies! Origins and Traditions ?A blended cold beverage made from fresh fruits and ice. The difference between a fruit smoothie and a fruit juice is that smoothies use the whole fruit making it thicker than just juice. This gives smoothies additional nutrients that are better than just a fruit juice. Smoothies became widely popular in the United States in the late 1960s when ice cream vendors and health food stores began selling them. By the 1990s and 2000s, smoothies became available at mainstream cafés and coffee shops and in pre-bottled versions at supermarkets all over the world. 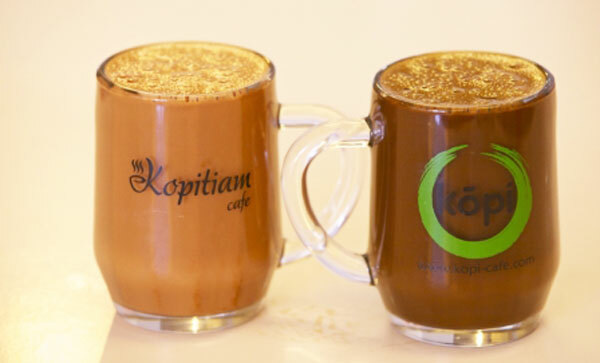 Kopi Icy Drinks Come in an assortment of flavors! 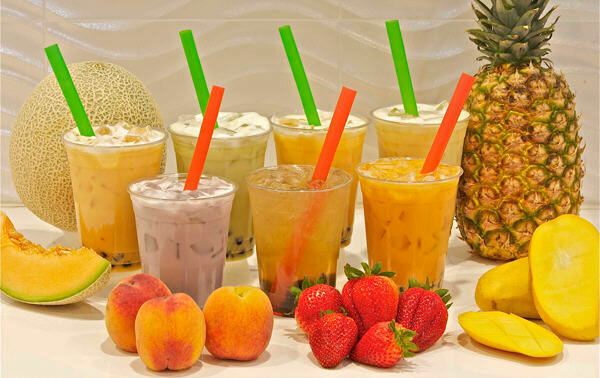 Or, cool down with our naturally refreshing Icy Drinks today !! Remember to savor this lovely dessert slowly, or else: Brain Freeze! 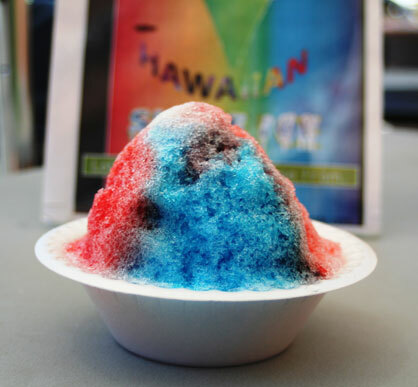 OUR House Special Shaved Ice is smooth and refreshing. Smooth shaved ice covered with delicious toppings and sweet sauces. This is a popular and traditional dessert in Singapore, Malaysia and across Southeast Asia. It is also known as 'ABC' (acronym for Air Batu Campur) which literally means "Mixed Ice". The perfect dessert to share on a hot afternoon!! 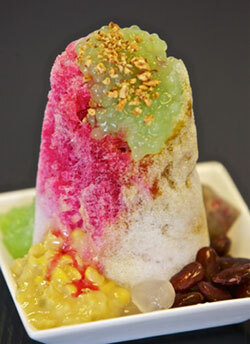 Origins And Traditions ?Ice Kachang was traditionally made of only shaved ice and red beans. Today, however, Ice Kachang can come in as many bright colors and with different toppings as the imagination can take you. A final topping of evaporated or condensed or coconut milk is drizzled over the mountain of ice along with red rose syrup. We believe the more varieties of ingredients in your ice, the better; nothing like biting into multiple textures every time you take a mouthful. Available in more than 20 flavors! 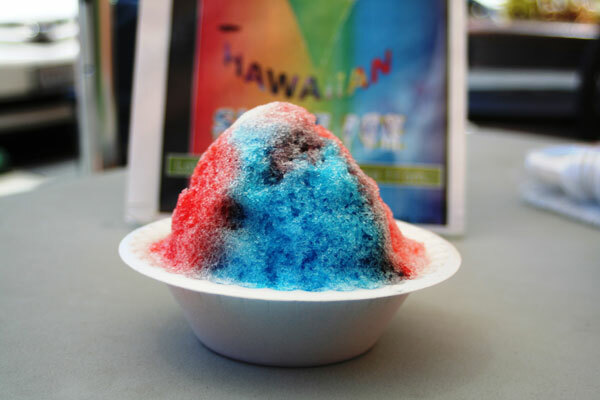 Hawaiian Shave Ice . . 20+ flavors! Cherry . . Grape . .
Blue Raspberry . . Strawberry . . Lemon . . Lime . .
Pineapple . . Coconut . .
Root Beer . . Cotton Candy . . 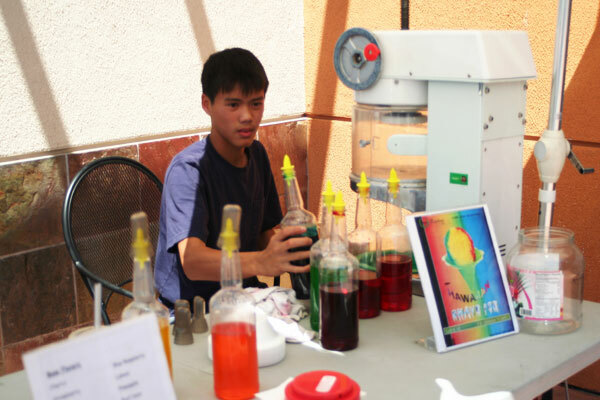 Bubble Gum . . Watermelon . .
Mango . . Honey Dew . .
Coffee . . Guava . .
Come get one now! . . .